37/126 Kim Hollis Very weird, very strange, very amusing. A teen flick from a different mold. 39/48 Les Winan Eh. Not sweet. 46/55 Reagen Sulewski "I graduated from the Sundance School of Cult Filmmaking, and in 7 easy steps, I can help you make your cult film too!" Imagine the most over-the-top cartoon characters you’ve seen on TV. Now imagine them brought to life. That’s a pretty good description of the people in this film from the husband and wife writing team of Jared and Jerusha Hess who are making their feature film debut. Jared also takes a shot at directing the film. This film is based on a nine-minute film also directed by Jared Hess that was screened during the 2003 Slamdance Film Festival called Peluca. That film was shot in two days on a budget of $500. They had a little bigger budget this time, but not an outrageous amount. 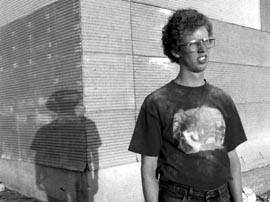 Our movie is about a strange teenager named Napoleon Dynamite (Jon Heder) growing up in rural Idaho. He has a love for dancing, but doesn’t have anyone to take to the upcoming school dance. A new kid named Pedro (Efren Ramirez) comes to school and the two immediately bond. At home, Napoleon’s wild grandma (Sandy Martin) is laid-up because of an ATV accident. She sends for Uncle Rico (Jon Gries) who comes to take care of Napoleon and his 32-year-old (yes, 32) brother Kip (Aaron Ruell). But Rico isn’t a very good influence because of the shady business deals in which he participates. There are a lot of other wonderful characters in the film and critics and moviegoers alike have shown their appreciation for this effort. This coming-of-age film is unlike any you’ve ever seen and it should stick in your mind for a long time to come.